The Grammys featured some amazing celebrity moments last night! Taylor Swift’s opening performance started off an incredible line-up of performances, including Lady Gaga’s David Bowie tribute and Stevie Wonder pairing up with acapella group Pentatonix. Some of the musical performances even doubled as our favorite fashion moments. Pitbull’s song with special guest Sofia Vergara took our breath away: she wore one of our favorite designers, Kleinfeld exclusive Mark Zunino! All of the celebrities wore their best looks ever, and we know we can help you match them. Romona Keveza “bridals-up” this classic silhouette with delicate lace, spaghetti straps and a sweetheart neckline. This lace pantsuit by Pnina Tornai is the perfect balance of fashion-forward and romantic. This sheath satin dress by Elizabeth Fillmore is all elegance in the front with a little bit of bling in the back. It’s Sofia’s dress but bigger, better and bridal. 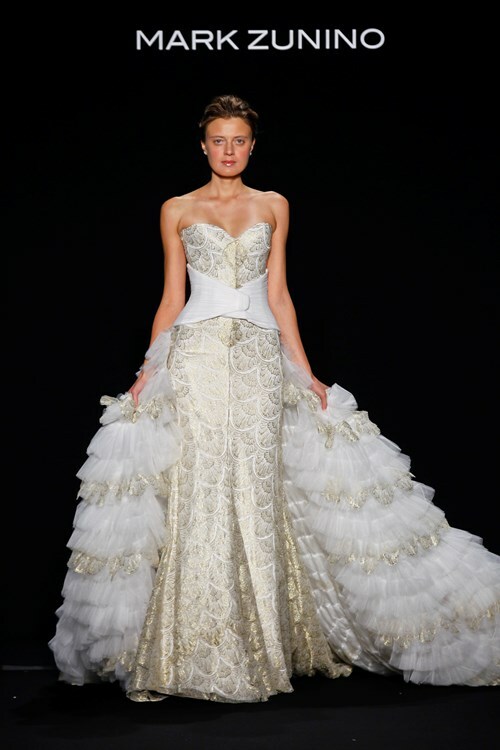 Walk the runway in gold silk with a detachable tiered skirt by Mark Zunino. Say Yes to capes! This sheath dress by Pronovias hugs all the right places and has just the right amount of drama.